The town hall is on the southern edge of the town and its clock tower is perhaps still its highest point. A broad valley runs down from the town hall and rises on its northern side to Royal Park and at its western end to Hotham Hill, distinguished by the Ukrainian Cathedral and St Michael’s Church and backed by the high-rises variously known as Hotham Heights or ‘the flats’. Sir Charles’s name had greater heights awaiting it in the form of the alpine peak Mount Hotham. His name also lives on in a federal electorate, a couple of hotels and a number of streets, none in North Melbourne. Ellery did not live in North Melbourne — as colonial astronomer from 1853 to 1895 he was based briefly in Williamstown and later at the observatory in the Domain, which worked in with the observatory on Flagstaff Hill. Even so, North Melbourne owed much more to him than the design of our famous clock. 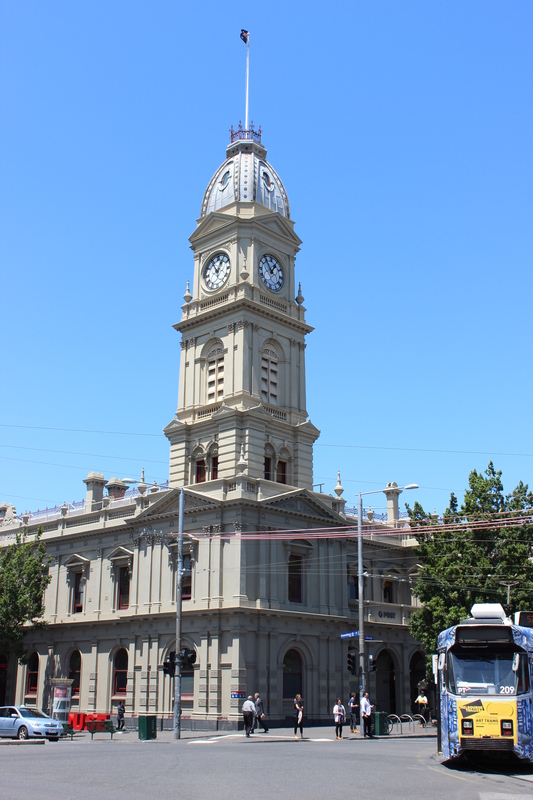 When he designed the clock, in 1878, Ellery was in effect the sole keeper of the right time in Victoria. The world did not begin to standardise on Greenwich time until 1884. Before then Ellery’s observatory took readings from the sun and telegraphed the time to whoever wanted it. North Melbourne used Ellery’s time until standard time came in. Diagonally opposite the town hall tower is a bank, built in 1874 as the Bank of Victoria. Beside the bank is Mattingley Lane, named after Elizabeth Mattingley, founder of one of Hotham’s first national schools, in Errol Street, near the town hall. Elizabeth was the mother of Albert, who for many years was head teacher at Errol Street School. Arthur Mattingley was a keen advocate for national parks and a founder of the great Wyperfeld National Park in Victoria’s Mallee country. For this he was honoured by having the highest point in the relatively flat Wyperfeld named Mount Mattingley. Bill Hannan is a local resident and member of the Hotham History Project. He contributes articles regularly to the North and West Melbourne News.